Product information fpr "Pompöös by Casa Padrino Luxury Balloon Baroque Chair Isabelle Black / Leopard with glittering crown - Pompööser Baroque Armchair designed by Harald Glööckler"
Casa Padrino presents you the luxury balloon baroque armchair from the Pompöös collection by Harald Glööckler, the "Prince of Pompöös". The golden Glööckler crown in the inner part is covered with numerous rhinestones. 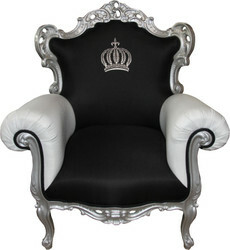 The magnificent luxury balloon baroque armchair is an absolute eye-catcher. 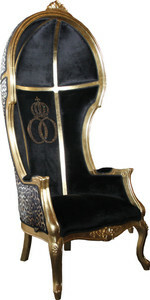 Technical data for "Pompöös by Casa Padrino Luxury Balloon Baroque Chair Isabelle Black / Leopard with glittering crown - Pompööser Baroque Armchair designed by Harald Glööckler"
Rating for "Pompöös by Casa Padrino Luxury Balloon Baroque Chair Isabelle Black / Leopard with glittering crown - Pompööser Baroque Armchair designed by Harald Glööckler"